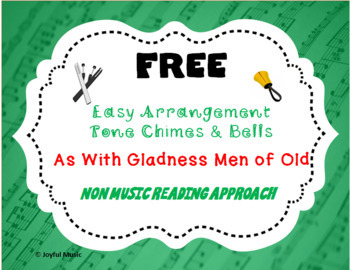 Enjoy using this Easy Tone Chimes & Bells arrangement of FREE CHRISTMAS HYMN - AS WITH GLADNESS MEN OF OLD. Players do not need to be able to read music in order to play this piece! This product uses a “non-music reading” approach. 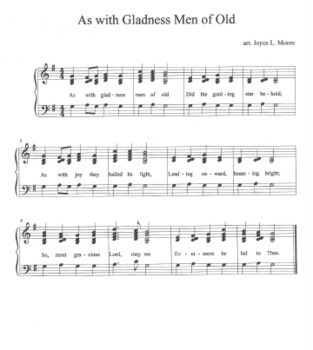 While it could be used as an accompaniment for singing, it is written in order to be played as an ensemble piece. It contains the entire melody and accompaniment. This approach gives players a sense of accomplishment in learning to “read and perform” in a short period of time and enjoy the feeling of “playing in an ensemble.” It can easily be rehearsed in one rehearsal. Please rate the product and follow my store if you are not already following. 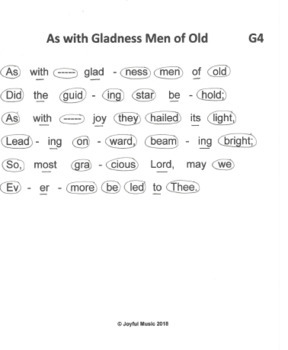 Enjoy using this easy arrangement with your Bell Choir groups! If you have any questions, please contact me! Thanks!